Circa 1920. Rectangular, plinth-shaped war memorial. Channelled ashlar sarcophagus with base course and bracketed cornice raised on 2 steps; central bronze plaque dedicated to soldiers of the Great War in moulded stone surround with flanking relief. Bronze plaque to rear of memorial, dedicated to WW2 soldiers, and bearing the inscription: NOTHING IS HERE FOR TEARS. NOTHING TO WAIL, DISPRAISE, OR BLAME. NOTHING BUT WELL AND FAIR, AND WHAT MAY QUIET US IN A DEATH SO NOBLE. 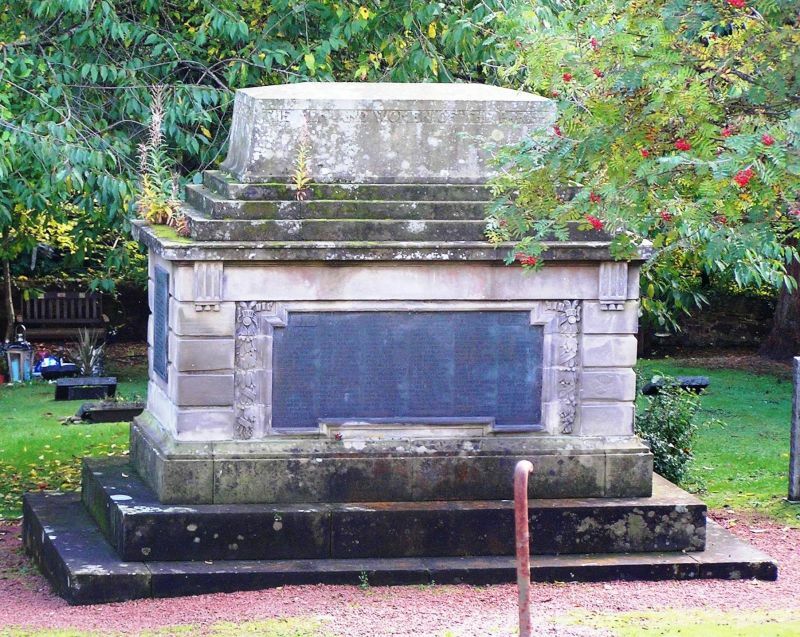 Short pedestal with canted corners, on 3 steps surmounting memorial; inscribed inscription reading: IN MEMORY OF THE MEN AND WOMEN OF THE PARISH OF COLINTON WHO GAVE THEIR LIVES IN THE GREAT WAR. A municipal war memorial in the twentieth century cemetary adjacent to St Cuthberts Church. This site was previously occupied by a mill, which was demolished in 1916. From its pedestal-like shape, it seems likely that this memorial was originally intended to be surmounted by a statue.